Home→Fares→Off-Peak tickets should be “Super” at Sevenoaks too! ← Bat & Ball? That’s £4 extra! Off-Peak fares are a long-standing promotional fare – both to encourage people to travel outside the morning peak if they can and to encourage leisure journeys that would not otherwise be made at all. On Southeastern off-peak return fares to London are typically 50-56% of the “Anytime” return fare. However stations from Tonbridge and further outwards from London also have “Super Off-Peak” return fares that offer further discounts – ranging from 47% of the Anytime fare at Tonbridge to 35% of the Anytime fare at Folkestone. There are no Super Off-Peak fares from Sevenoaks, or Hildenborough, to London. This explanation does not seem logical. First, as promotional fares, Super Off-Peak would only be commercially sensible if the gain from journeys that would not otherwise have been made (for an Off-Peak fare) is greater than the loss from journey that would have been made anyway paying an Off-Peak fare. The difference between off-peak and super-off-peak fares shows that Southeastern would lose money on Super Off-Peak fares unless they generated 19% more journeys from Tonbridge, 37% more journeys from Tunbridge Wells and 43% more journeys from Hastings. The required elasticity of demand at Tonbridge is plausible. However it’s harder to believe that the elasticity at Tunbridge Wells or at Hastings could really be double that of Tonbridge; if it isn’t this would mean that passengers from Tunbridge Wells and Hastings to London are getting a very good deal. Second, there’s only a short interval on each weekday when an Off-Peak is valid but a Super Off-Peak is not: only 54 minutes (5 trains) from Tonbridge to London and only 85 minutes (3 trains) from Hastings. Super Off-Peak fares are available on the 0929 from Hastings and on the 1001 from Tonbridge onwards. With Super Off-Peak fares available for almost all of the off-peak period, it’s hard to see why Southeastern do not just allow them throughout the off-peak period, and do away with the relatively rarely used non-super Off-Peak fares. This would simplify the fare system, make ticket machines easier to use and reduce the risk that passengers pay more than they should for their journey. Third, if Super Off-Peak fares are promotional fares for longer journeys, why is there no Super Off-Peak fare from Sevenoaks to leisure destinations like Canterbury West (48¼ miles) or Hastings (40½ miles) while there is such a fare from Tonbridge to London (27¾). (Indeed why isn’t there a Super Off-Peak fare from Tonbridge to Canterbury West either?!) An additional consideration would be that trains away from London in the late morning are even emptier than trains towards London. If Super Off-Peak fares to London are justified from stations like Tonbridge, Tunbridge Wells and Hastings, as Southeastern claim, then they would also be justified from stations like Sevenoaks and Hildenborough. Even on the most cautious comparison (Tonbridge) a Super Off-Peak return from Sevenoaks to London of £11.25 would both save passengers here £1.85 on each off-peak return trip and be profitable for Southeastern. There’s no logic in restricting Super-Off Peak fares to journeys to and from London. They should also be offered for journeys between stations in Kent – such as from Sevenoaks to Hastings, Canterbury, Ashford and Maidstone. There’s not much point in having both Super Off-Peak fares and Off-Peak fares. All Southeastern off-peak fares should be at Super Off-Peak rates and valid for the whole off-peak period. Tonbridge passengers also benefit from having advance fares which at £12.20 for two singles to London and back is cheaper than the £13.10 off peak return fare to London from Sevenoaks. @barry That’s true. 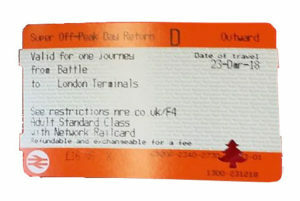 However Advance fares are very restricted – stated train only, purchase in advance – compared to Off-Peak fares. Our point is that Super Off-Peak fares are almost as flexible as Off-Peak fares, but much cheaper for the stations from which they are offered.